In a previous article I showed you why it is beneficial to support Knowledge Sharing in your organization. 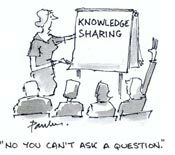 If you haven’t read this article yet go and check it out first: How to Support Knowledge Sharing in Your Organization? In this follow up post I will show you the top 6 tools you can use to as part of your Knowledge Sharing Infrastructure. The main focus is on how those tools can be used to to support parts or the entire outlined concept. WordPress is world’s leading blogging platform. It is free and easy to use. The open source project is driven by a dedicated community. Due to its plug-in architecture and strong user community there are tons of plugins available for WordPress. A self-hosted version that can be installed on any server is available. WordPressMU is a special version of WordPress that allows multiple blogs on one installation. WordPressMU could be uses out of the box to establish a corporate blogging system. Drupal is best open source content management system available. Equipped with a powerful blend of features, Drupal supports a variety of websites ranging from personal weblogs to large community-driven websites. Like WordPress it also has a very strong user community and many plugins. Social Networking Features are available. Social Networking features are not integrated out of the box. SharePoint is an integrated suite of products to create a Microsoft intranet and collaboration portal. Yammer is a private Micro-blogging service for in-company use. In addition to Micro-blogging there are discussion boards and users can form/join groups. SocialCast is a Yammer competitor. Status.net is a self-hosted open source Micro-blogging server. To realize the outlined concept the integration of different tools like Profiles, Microblogs, Blogs, Wikis into a common News Feeds is key. The Elgg Social Media Platform is the fastest and easiest way to realize the outlined concept. Elgg is a free, open source social media platform. It is more than just social networking but can support a huge variety of social media tools like bookmarking, blogging, wikis, files, RSS feeds, micro-blogging and more – all in one platform. Elgg allows individuals to create, organize and manage their own personal resources and contacts, as well as work with others – co-creating and sharing content and resources – in groups. There are a huge number of different social media tools available. Although some people can cope with working with a large number of tools; others are overwhelmed by this – and is even putting them off getting engaged with social media. If you need help setting up your own Elgg environment you can contact the the Elgg consultancy services. Thanks for the post. Although the 6 tools you suggest are or can be used as knowledge sharing tools, I think your top 6 selection lacks corportate experience/feedback. Mainly, it’s hard to find companies where most employees adopted sharepoint. Bad user experience is bad for adoption. Also many studies/reports show that people tend to use Yammer just like they use facebook, which ends up in very little meaningfull and relevant knowledge. It would be nice if you would do an update on that post after trying some newer tools like Crowdbase, Huddle and Evernote and give your comments. Worth noting that you can get the fully-featured Elgg social hub without the need to download, configure and host it yourself at http://www.elgg.com.